COMMENTARY — August 17, 2058, that’s the date I am going to die (just seven days shy of my 92nd birthday). How do I know that? I checked my Death Clock on the internet (and if it’s on the internet, then it must true). That’s right, some genius has figured out how to use a handful of parameters to calculate not only the date of your death, but the number of seconds you have left to live. One of the parameters that has a huge impact on your expected life span is your general attitude in life. The August 17, 2058 date above is based on me generally being optimistic. If I replace that single variable with just a normal attitude, my projected life span plummets to June 5, 2039 (which won’t even get me to age 73). Now, I’m not some hayseed that just fell off of a turnip truck. I know the Death Clock is barely more than a wild guess at the actual date of my death (and even the Death Clock creator candidly admits so on his website). However, as chronicled by Emily Esfahani Smith in an article for The Atlantic, the health benefits of optimism are real and supported by medical and scientific research. And what better cause for optimism is there than my beloved Utes? Consistent with many past columns, I am going to keep my crimson-colored glasses on. Jakob Poeltl and the Runnin’ Utes had an impressive weekend. Let’s start with the Runnin’ Utes, who became the first Pac-12 team this season to sweep UCLA and USC on the Los Angeles road trip. In those two games, Jakob Poeltl was an absolute beast, averaging 22 points, 12 rebounds, 3 assists, 2.5 steals, and 1 block per game. 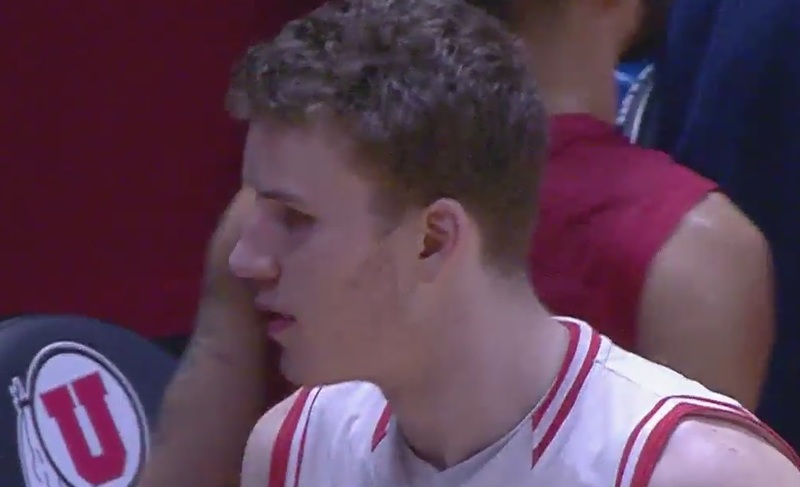 Enjoy the show while you can, because I can’t imagine Poeltl not playing in the NBA next year. Neither can the many talking heads either, with Bleacher Report predicting he will be the sixth player taken in the draft. Utah beat UCLA in Los Angeles for the first time since Dec. 29, 1961 (and yes, that was before I was even born). Utah legend Billy “The Hill” McGill had 29 points and 24 rebounds in that game. While no single Runnin’ Ute would match McGill’s individual effort in last week’s game, Utah did have four players in double figures with Jordan Loveridge and his 17 points leading the way. It wasn’t all rainbows and unicorns for Utah against UCLA as the Runnin’ Utes saw a 14-point lead with seven minutes left to play evaporate into a mere 2-point lead in less than five minutes of game time (does anyone else remember the tragic ending to Utah’s road game against Oregon State?). However, the Runnin’ Utes had the grit and determination needed to hold on and grind out a big road win. Against USC, Utah took the lead after less than three minutes of play and never relinquished it the remainder of the game. The Trojans went on a run early in the second half to cut the lead to five, but the Runnin’ Utes weathered the storm and never looked back. Utah’s win snapped USC’s 16-game home winning streak dating back to last season. The Runnin’ Utes now have sole possession of third place in the Pac-12 and are only a half-game back of Arizona and Oregon. After losing three of its first four conference games, Utah has now won 9 of the last 11, and finishes conference play with three straight home games. 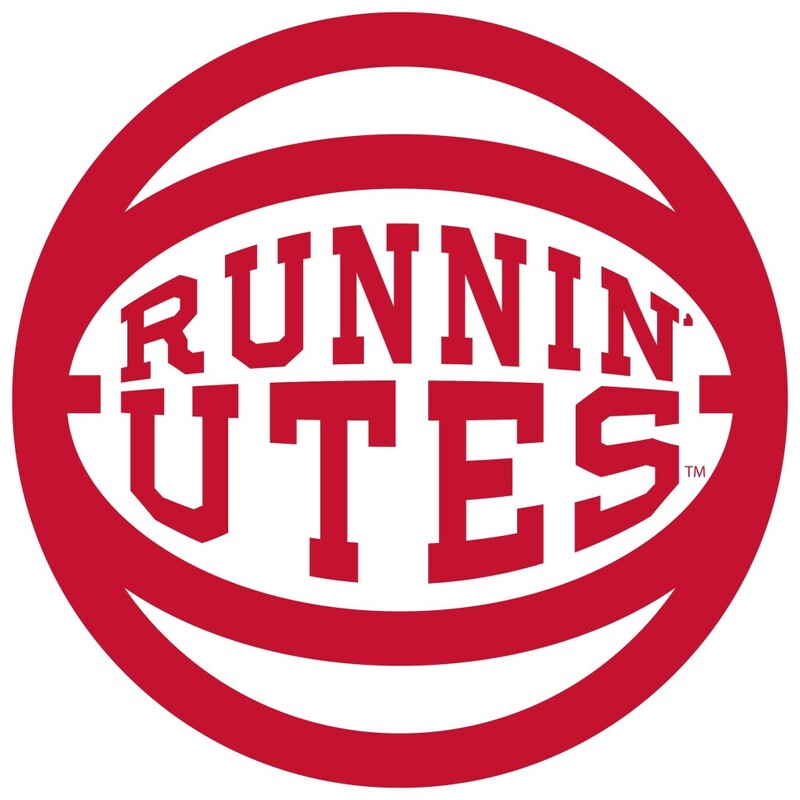 Looking ahead to the Big Dance, ESPN continues to project the Runnin’ Utes as a 6-seed. However, CBS Sports has moved Utah up to a 3-seed, and USA Today has the Runnin’ Utes slotted as a 4-seed. Utah hosts Arizona State this Thursday at 7 p.m. (televised on the Pac-12 Network). Arizona then comes to town on Saturday for a noon game (televised on ESPN). Forget mere optimism, when it comes to pure joy and wonder, nothing puts a smile on my face like the beautiful and talented Red Rocks! No, 5- ranked Utah has continued its upward trajectory by taking down No. 12 Stanford on The Farm last Saturday. The Red Rocks tied their season-high score of 197.150 for their fourth consecutive score of more than 197 points (including two road meets). In a day and age where video games rule and people live out fantasies in role-playing games in the electronic world, no video game can match the amazing real-life performances by these talented ladies. The gymnasts are essentially under a microscope in each individual performance, with multiple judges scrutinizing every flip, each twist and turn, looking for the slightest wobble or miscue. However, the Red Rocks are unflappable, and shine brightly back in the face of the spotlight. Breanna Hughes vs. Stanford, Palo Alto, Calif., Feb 20, 2016 | Photo by Deena Lofgren, University of Utah Photo Dept. Going into the meet, Stanford boasted the nation’s top-ranked all-arounder, Elizabeth Price. However, Utah captured the top two all-around spots with both Breanna Hughes (1st, 39.400) and Samantha Partyka (2nd, 39.175). Unfortunately, it was senior night for the Cardinal, and a season-high 1,288 fans showed up for the meet (a number that is difficult for Utah fans to even imagine at a gymnastics meet). 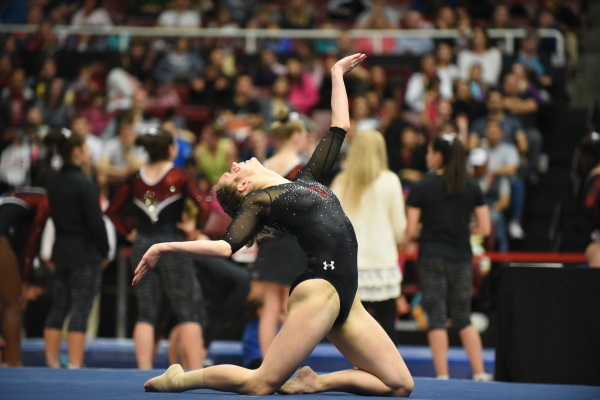 The pressure and intensity of the meets does not let up in the least for the Red Rocks as the Stanford meet started a streak of four consecutive senior night meets for Utah. The Red Rocks are on the road again this Saturday at 15th ranked California (for its senior night), with the meet televised on the Pac-12 Network starting at 2 p.m. MT. Utah then travels to No. 3-ranked Michigan on March 4 (for its senior night), and then closes out the season at home against 10th ranked Georgia on Mar. 12 (for the Red Rocks’ senior night). Here’s hoping the Runnin’ Utes and Red Rocks can keep the good times rolling, and keep giving their fans something to smile about (along with a reason to live long and prosper).